Remotely adjust settings on your drivers MESH Tracks app . There are various types of fleets and therefore different needs or expectations about how detailed, and in what format the recorded data should be. The MESH Tracks app comes with default settings that fit different types fleets. It also offers the ability to edit settings to customize the needs of your fleets. The MESH Tracks app can cover requirements such as needing more detailed recordings, record only at certain times, record only drives that exceed certain speed limits or walking, PIN protection and many more! 1. Log into MESH Tracks and click on your name in the top right corner. Select settings from the drop down. 2. Click Export/ Import and use the option 'Export settings'. Click 'Yes' to share exported settings. 3. Send these exported settings to your email, or use your preferred method of downloading these settings to your computer. 4. Now that your settings are on your computer, log in to the web application at https://tracks.go-evo.com. 5. 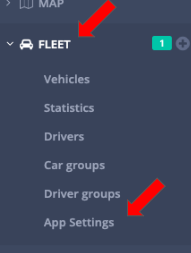 Using the navigation menu on the left click Fleet, then App Settings from the drop down menu. 6. Click on '+ Add app settings'. This will bring you to a form to create new settings. 7. 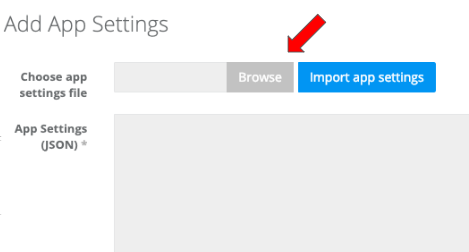 Click on 'Browse' and select the exported settings file from your computer. 8. Once selected, click 'Import app settings'. Your settings will show up in the 'App Settings (JSON)' below. 9. Where asked, enter a name for these settings – this is for identification later. 10. Select drivers that you want to share these settings with. Alternatively you can use the option 'Assign app settings to all my drivers' if you want to share these settings with everyone. 11. Click 'Save and push app settings to drivers'. Your settings are now being pushed to drivers. Note: By default, MESH Tracks App has app settings allowed. This can be turned off under Menu/ Settings/Online Tracking & Synchronization. If it’s turned off shared settings will not be applied in the app.